Well, Summer is here in the Philippines! We've taken the season lightly at first but these days, staying inside the house makes you feel like you're in a oven toaster or microwave. But! There are some good things that this season has to offer. 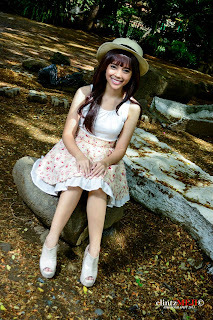 I had a photo shoot with Clintz Meji Photography and Kim Mantos Photography last March 23 at the Quezon Memorial Circle. It was a hot day but the heat then wasn't as intense like it is these days. I love hats actually. And other hair accessories too - headbands, pins etc. I'm particularly fond of straw hats so whenever I see one in a store, I just stare in awe and my conscience starts talking to me if I should but it or not.